In December 2006, President Felipe Calderón announced that Mexico would begin a campaign to target drug traffickers. Since then, as the Mexican government deployed its army and federal police to cities and communities across Mexico, more than 10,000 people have been killed in drug related violence. Overall, a large majority of Mexicans see illegal drugs as a very big problem, with a greater share saying so today compared to 2007. When asked which nation is most to blame for the drug-related violence, many say both Mexico and the United States are to blame. The Mexican government has responded to the increase in violence with a stepped up law enforcement and military presence in many parts of Mexico. 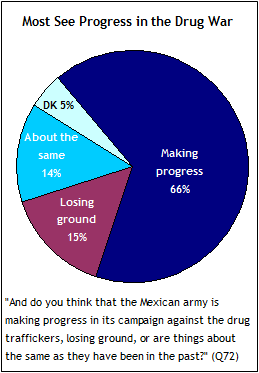 Overwhelmingly, Mexicans support deploying the army in the campaign against drug traffickers, and most think the army is making progress in this campaign. There is also strong support for using U.S. resources to assist the Mexican army and law enforcement personnel. However, the Mexican public strongly opposes the use of U.S. troops in Mexico in the campaign against drug traffickers. 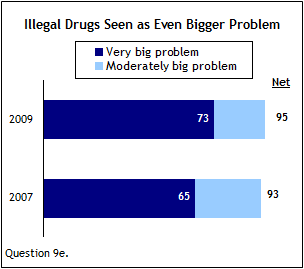 Virtually all Mexicans say illegal drugs are a big problem in their country and even more see illegal drugs as a very big problem than did so in 2007. Currently, 73% say illegal drugs are a very big problem, compared with 65% two years ago. Opinions about which nation is mostly responsible for the drug-related violence in Mexico are more mixed. About half (51%) say both the U.S. and Mexico are to blame. 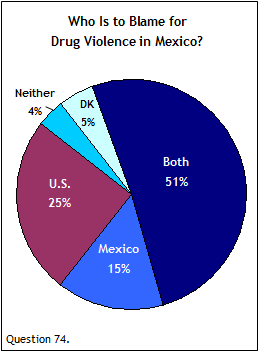 However, one-quarter identify the U.S. as mostly to blame for the drug violence, while 15% say Mexico is mostly to blame. Overall, 83% of Mexicans say they support the use of the nation’s army to fight drug traffickers, while only 12% oppose the use of the army. Moreover, about two-thirds (66%) say the army is making progress in the drug war, while 15% say it is losing ground and 14% say things are the same as they have been in the past. When asked about the possibility of the U.S. helping Mexico in its campaign against drug traffickers, Mexicans support U.S. help in the form of training, money or weapons. Nearly eight-in-ten (78%) Mexicans say they support the use of U.S. resources to train Mexican police and military personnel, while 17% oppose this approach. 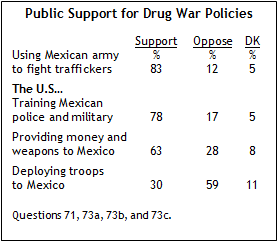 Similarly, 63% support the U.S providing money and weapons to help in Mexico’s campaign against drug traffickers, while 28% oppose such a move. While there is strong support among the Mexican public for U.S. assistance in the form of training or the provision of weapons and money to the Mexican military, most do not want to see U.S. troops deployed to their country. Nearly six-in-ten (59%) oppose the use of the U.S. military in Mexico to fight drug traffickers, although a sizeable minority (30%) supports the use of U.S. troops in Mexico.